Jerusalem (AFP) – Israel will on Monday receive its first F-35 stealth fighter jets, hailed as technological marvels whose helmets alone cost more than most people’s homes but criticised for their price and initial flaws. Built by US aerospace giant Lockheed Martin, the first two planes’ arrival in Israel is being welcomed as a major event for the country’s military as it seeks to maintain dominance in the turbulent Middle East. US Defence Secretary Ashton Carter is to attend the arrival along with his Israeli counterpart Avigdor Lieberman at the Nevatim air base in the country’s south. 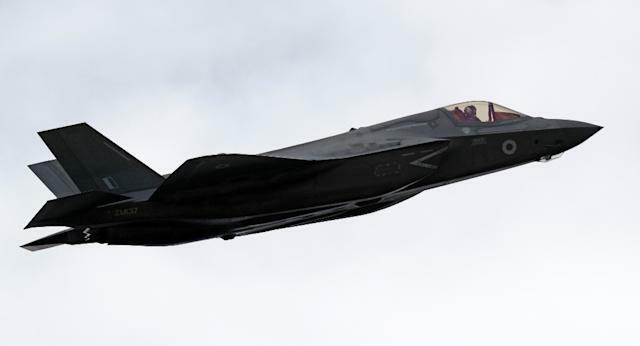 The delivery of the first two of 50 F-35s to be purchased by Israel comes as the years-long development of the most expensive plane in history reaches a critical stage. While a list of countries have ordered the planes, Israel, which receives more than $3 billion a year in US defence aid, will be the first with an operational F-35 squadron outside the United States. “I think we don’t fully understand the big advantage of the F-35,” an Israeli air force official said. Israel has given it the name “Adir” — which means “mighty” in Hebrew. Its first planes are expected to be operational within a year after delivery. It will be receiving the F-35A model for standard takeoff and landings. The B and C models are for short takeoffs and aircraft carriers. Among their main features are advanced stealth capabilities to help pilots evade sophisticated missile systems. The single-pilot jets can carry an array of weapons and travel at a supersonic speed of Mach 1.6, or around 1,200 miles per hour (around 1,900 kilometres per hour). It is unclear if Israel’s planes will be able to deliver nuclear bombs. Israel is believed to be the Middle East’s sole nuclear-armed power, though it has never acknowledged it. The ultra-high-tech helmet, at a cost of some $400,000 each, sounds like something out of a science-fiction film. It includes its own operating system, with data that appears on the helmet visor and is also shared elsewhere. Thermal and night vision as well as 360-degree views are possible with cameras mounted on the plane. Israeli firm Elbit Systems has been involved in the helmet’s production. In Israel, the planes, designed for multiple combat situations, will initially replace a group of ageing F-16s. They are seen as helping the country maintain its edge in the Middle East, particularly as its main enemy Iran seeks further influence in the region. “The F-35 has been designed to deal with the most advanced threat systems now being fielded in the Middle East,” Lockheed Martin’s Steve Over told AFP by email. Israel is especially concerned over whether Iran will seek to develop nuclear weapons by violating the international accord it has signed with world powers aimed at preventing it. The country is also keeping an eye on Lebanon’s powerful Shiite militant group Hezbollah, with which Israel fought a devastating war in 2006. Beyond that, in neighbouring Syria, Russia has deployed the sophisticated S-300 and S-400 anti-aircraft systems as it conducts an air campaign in support of President Bashar al-Assad. Israel is buying its first 33 jets at an average price of about $110 million (103.5 million euros) each. The government last month approved the purchase of the remaining 17. As a comparison, in 2001, Israel agreed to buy 52 additional F-16s from Lockheed Martin at a total cost of $1.3 billion. While the technology can seem dazzling, there have been questions over whether the plane will be worth the cost. A list of flaws have been uncovered, including one where pilots who weighed less than 136 pounds (62 kilos) risked being killed by its eject system. There have also been software bugs and technical glitches, though Lockheed Martin assures such issues have been overcome. Some in Israel have also said the price of the planes will limit the number that can ultimately be purchased, while losing any in combat will be particularly costly. There have also been questions over whether upgrades to the air force’s existing fleet could have sufficed. But the F-35 was “the only game in town” since Israel relies so heavily on US defence aid, said Yiftah Shapir of Israel’s Institute for National Security Studies. In the United States, the air force declared an initial squadron of F-35As ready for combat in August, without giving a timeline for actual combat. The US Marine Corps in 2015 announced that a first group of F-35Bs had attained initial operational capability, though these too have not yet been used in combat.